New Connect Tech Carrier and Adapter for NVIDIA Jetson AGX Xavier Now Shipping - Connect Tech Inc.
San Jose, CA, March 19, 2019 – Connect Tech’s two new product offerings for NVIDIA Jetson AGX Xavier – the Rogue Carrier and the Mimic Adapter – are now shipping. Connect Tech’s Rogue Carrier for NVIDIA Jetson AGX Xavier is a commercially deployable, full featured carrier coming in just slightly smaller than the module at 92mm x 105mm. The Rogue Carrier provides access to the impressive list of latest generation interfaces on the Jetson AGX Xavier while adding additional interfaces of 3x USB 3.1, 2x GbE, 2x HDMI and locking Mini-Fit Jr. power input connector. Rugged camera add-on expansion boards will also be available for use with the Rogue Carrier to interface directly with the module’s high-density MIPI CSI interfaces. The Mimic Adapter from Connect Tech allows the NVIDIA Jetson AGX Xavier module to be installed onto an NVIDIA Jetson TX2/TX2i/TX1 carrier. It is ideal for NVIDIA Jetson users who want to easily compare performance or upgrade their existing TX2/TX2i/TX1 designs to the new Jetson AGX Xavier. 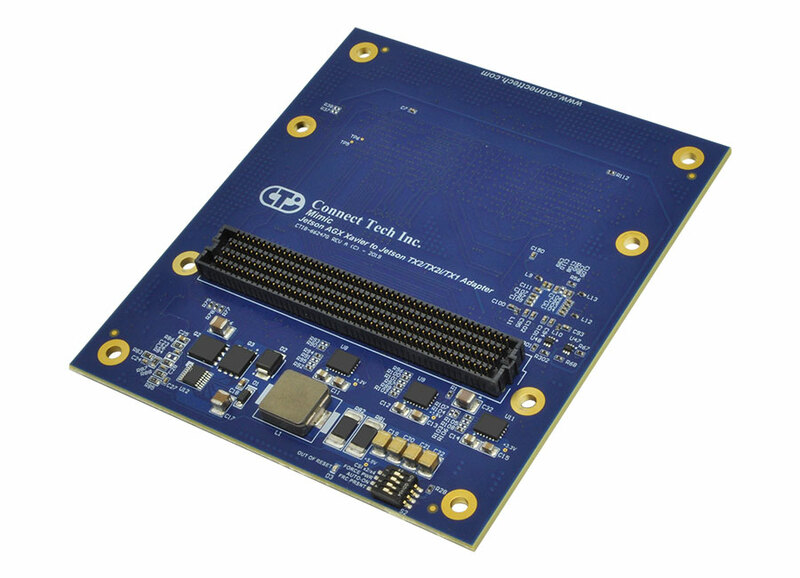 This small form factor adapter solution integrates easily onto any carrier board in Connect Tech’s Jetson TX2/TX2i/TX1 product line, as well as any custom platform. This enables a giant leap forward in capabilities for autonomous machines and edge devices. The NVIDIA Jetson AGX Xavier has an impressive 512-core Volta GPU and 64 Tensor cores with discreet dual Deep Learning Accelerator (DLA) NVDLA engines. The platform offers 20x the performance and 10x the power efficiency of the Jetson TX2. 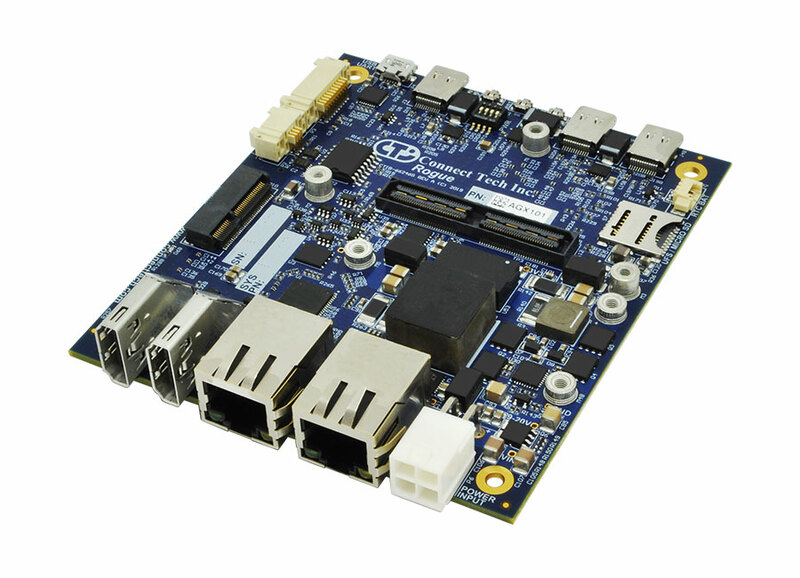 The new module supports an increase in bandwidth, performance, and introduces USB 3.1 and PCIe Gen 4.0. “The Jetson AGX Xavier is an exciting release and just as we supported the TX2/TX2i/TX1 with a wide range of commercial off the shelf and custom solutions, we have full intentions for doing the same for this platform,” said Michele Kasza, vice president of sales and marketing at Connect Tech. Connect Tech’s Rogue Carrier and Mimic Adapter will be on display at GTC 2019 from March 19 to March 21, 2019 at Booths 1347 and 1742 in San Jose, California. Connect Tech is the largest NVIDIA Jetson ecosystem partner specializing in small form factor, rugged computing. We are proud to support the Jetson AGX Xavier, Jetson Nano and Jetson TX2/TX2i/TX1 platforms. We are backed by a knowledgeable sales and support staff, well-versed in each Jetson module. Offering 12 standard products for TX2/TX2i/TX1 and multiple custom design wins, we help take your applications to market fast.